For his research businessman Magnus Resch contacted 8.000 galleries all over the world. Over 1.000 responded. After a careful analysis of the answers the volume “Management of Art Galleries” was published. An interview about global markets, locations and protagonists. Mr. Resch, for the German and English edition of your book that has just been released a German and an American gallery owner wrote the respective foreword. You yourself have recently moved from Berlin to New York. How important is the location to an increasingly global art market? It is vital, because the art market is tiny. The annual revenue generated by all players in the art scene – that is all the galleries, auction houses and dealers – barely equals the sales of the logistics company FedEx. Germany plays a very minor role. The Number One world location is New York, followed by London and then Hong Kong. The customers are international and a gallerist has to follow them. Many gallery owners are now aware of this. And it is one of the reasons behind the steep rise in art fairs. My latest survey reveals that in 2015 almost 90 per cent of all galleries want to attend the same number of art fairs or even more. “Middle-size is too small”, was a recent quote in the „Süddeutsche Zeitung“ made by the two Berlin gallerists Berliner Esther Schipper and Jörg Johnen, in response to the merger of their successful galleries. Does size make such a difference in the art market? No, not really. Individual dealers can be successful on their own. With just a few artworks, but ones that reach top prices and have attractive margins – the luxury segment provides excellent conditions in this respect. It is the personal network that is so decisive. Gallerists, however, have other challenges to face. Their goal is to achieve market power and greatness for their artists. They want to create a brand, and to this end they are willing to accept high fixed costs for rentals and for employees. It is therefore only logical to bundle forces. Having access to greater resources makes it possible to represent artists on a global scale, not just in Germany. There is fierce competition in the art market, here supply is much greater than demand. Putting it plainly: there are just too many galleries around. The market is crying out for further consolidation. The focus in information galleries that emerged in the nineteen seventies was on communicating art, whereas today it is a sophisticated management that is supposed to boost sales. Who or what has changed? Nothing has changed. Today, dealing in art is still done in an unprofessional manner. 30 per cent of all galleries in the world operate at a loss. The market is subject to huge fluctuations and galleries are dying every day. Galleries are, however, so essential. To me they are the most important player in the art market. They discover artists, build them up and put their work in museums. They are doing society a great service, but it is a service that remains free of charge. Art halls are able to benefit from public funds, galleries are burdened with an increase in value-added tax. According to your premise there should be “less history of art and more management”. Is the art market protagonist no longer expected to boast expertise or understand greater thematic connections? Who is going to rule the art market in future? Requirements have become broader in scope. Business is now much more relevant. Today, customers do not simply purchase an attractive piece of art. They want to make money with it as well. And for this reason we have got to start talking about money. The Cologne gallerist and dealer Anne Aebels once said: “Our profession has reputation and you are jeopardising this when you start writing about business aspects”. That was 1965. Nothing has changed up until today. Art and commerce must cease to be mutually exclusive. Some galleries have already found the right balance. In the major study carried out on galleries around the world I have tried to define features that distinguish a successful gallery owner from the less successful ones. The answer is quite clear: the successful gallerist is top in the history of art and a good manager. Here commerce and art go hand in hand. But there is more to it than that. A third competency gallery owners need today is something I refer to as the socio/ethnical component. In a non-regulated market gallerists have to establish trust, and to do this they need to create standards, offer transparency in their work and deal with partners in a fair manner. It’s the only way to operate successfully in the long term. © Magnus Resch Magnus Resch studied economics in Harvard, London and St. Gallen and founded a gallery during his studies. After spending time in Berlin and Hong Kong Magnus Resch, who was born in Germany, now lives in New York. As an entrepreneur he is co-founder of Larry’s List, an online art collector database that also provides access to galleries. Resch lectures cultural entrepreneurship at the University of St. Gallen. Verlag Hatje Cantz 2015. 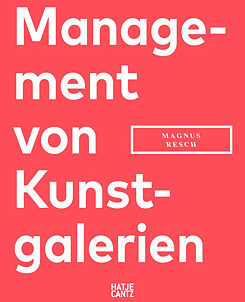 Englische Ausgabe: Management of Art Galleries, Foreword Jeffrey Deitch, Verlag Hatje Cantz 2015. English Edition: Management of Art Galleries, Foreword Jeffrey Deitch, Ostfildern 2015. Daniela Gregori conducted the interview. She works as an art historian and free-lance journalist in Karlsruhe.